using the “…” button pick the newly installed c:\Adobe\Photoshop CS folder and click Fix Old Program. Now you can happily run your Adobe Photoshop CS and ImageReady CS on Windows 7, Windows 8 or Windows 10 32bit or 64bit! 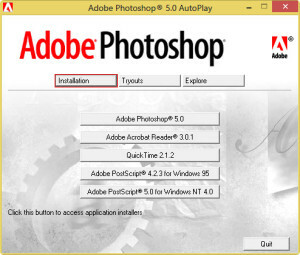 Ignore any errors related to not being able to “…create the folder ‘Adobe Photoshop 5′”, you will have to manually create a shortcut on your computer Desktop to your c:\Adobe\Photoshop 5.0 LE\photosle.exe by hand. using the “…” button pick the newly installed c:\Adobe folder and click Fix Old Program. 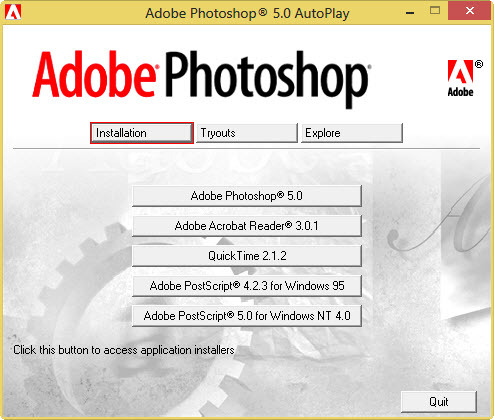 Now you can happily run your Adobe Photoshop 5.0 on Windows 7, Windows 8 or Windows 10 32bit or 64bit!